Looking for deals in Bath? Z Hotel Bath is in a prime location in Bath, opposite the Bath Theater Royal and provides a bar and free WiFi. The property is around 656 feet from The Circus Bath and 656 feet from The Roman Baths. Nice and comfortable hotel room. Really satisfied. 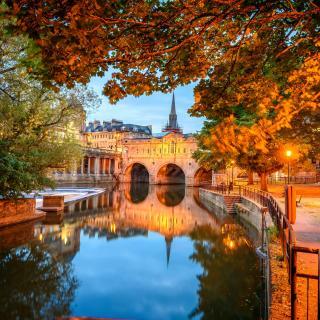 Apex City of Bath Hotel is located on the corner of James Street West in Bath City Center, a 5-minute walk from the Therme Bath Spa and 2297 feet from Bath Spa railway station. Everything is good here. The hotel is pretty new and clean. The double twin beds are big. Originating from the 1780s, Henrietta House is a Georgian period townhouse in the heart of Bath. It is a 10 minute walk from Bath Spa train station. Free Wi-Fi is available to all guests. A great welcome from Illy at reception who was most helpful and informative. The room was excellent, the breakfasts superb and the location unbeatable. There was nothing that they could have done better. Opened in December 2016, No.15 Great Pulteney is located just a 3-minute stroll from Pulteney Bridge, Bath Abbey and the Roman Baths. I absolutely love this hotel and would seriously rate it as one of the best I have ever stayed in. The design and decoration is outstanding, creative, beautiful and utterly unique. The rooms are perfectly equipped and have outstanding bathrooms with lovely amenities. The staff is delightful and charming. The Bar served one of the best Aperol Spritz I have ever had and the breakfast is wonderful. The location could not be better. It is literally 4 minutes walk to all attractions and restaurants. I wish there were more hotels like this. Located in Bath, Eight provides free WiFi. Popular points of interest nearby include Bath Abbey, The Roman Baths and The Circus Bath. The location could not have been better. The hotel is located on a quiet narrow cobblestone pedestrian street, just a block from the Roman Baths and the Bath Abbey. It's in a historic walk-up apartment building that has only eight rooms. The rooms are not large, but they are comfortable and well-appointed and charming. The full English breakfast (included in the room price) was served in a charming breakfast room with eight tables, and was great. The staff (mostly European) was friendly and helpful and multi-lingual, and carried all luggage up to the rooms. (The steep stairs might have posed a challenge otherwise). The staff allowed us to leave our luggage with them all day after we checked out. The hotel was reasonably-priced and fun, and we would definitely return to it on any subsequent visit to Bath. Bailbrook House is a Grade II listed property, set within 20 acres of private grounds, with commanding views towards central Bath and the countryside. The hotel provided a complimentary bottle of Proseco. Abbey Hotel, BW Signature Collection, is a 62-bedroom hotel in the heart of Bath. It is only two minutes' walk from the Roman Baths and Bath Abbey, and five minutes' walk from Bath Spa Railway... Great staff, location, style, rooms, Bar!!! Surrounded by beautiful gardens, Macdonald Bath Spa Hotel features a luxury spa and award-winning restaurant. The hotel is a 10 minute walk from Bath Abbey. Made to feel welcome! Lovely free upgrade! Lovely spa and great breakfasts! Set on the banks of the River Avon, Old Mill Hotel & Lodge has lovely gardens and stunning views over the countryside surrounding Bath. It is located on a site that housed a flour mill until 1907. The parking was a little sparse but other than that it was a great location and lovely staff. Opposite Bath Spa Station, this Georgian-style hotel offers fine cuisine and free Wi-Fi. It has an excellent location close to shops and about 2133 feet from the Roman Baths. The location was fantastic and the room was very comfortable. Great breakfast. With stunning views of the valley and 3 acres of private grounds, this traditional Georgian country house has a delightful village setting, in an area of outstanding natural beauty. Great views at this hotel and away from the traffic of Bath. A boutique townhouse hotel in the center of Georgian Bath, The Queensberry mixes modern style with historic architecture, offering a quiet courtyard garden and an award-winning restaurant. Great design, comfortable and stylish room, excellent and creative food and lovely garden patio. Francis Hotel Bath - MGallery by Sofitel has been restored to its former glory following a £6 million refurbishment. Excellent central position. Friendly welcoming staff. 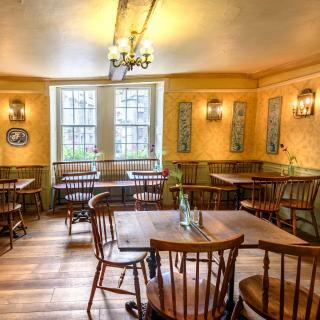 Located in central Bath, The Bird offers views over the city’s famous Recreation Ground, towards Bath Abbey. Love this place. It is peaceful, sophisticated, creative, comfortable and soothing. 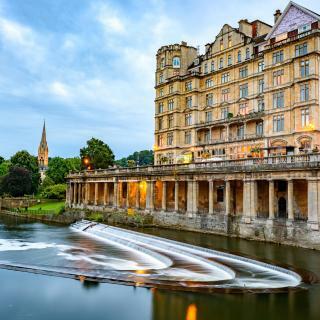 Which hotels in Bath are good for families? Many families visiting Bath loved staying at Eight, The Roseate Villa Bath, and Henrietta House. Which hotels in Bath offer an especially good breakfast? For hotels in Bath that serve highly-rated breakfasts, try Eight, The Roseate Villa Bath, and Henrietta House. Which hotels in Bath are good for couples? These hotels in Bath are highly rated by couples: Eight, The Roseate Villa Bath, and The Royal Crescent Hotel & Spa. How much does it cost to stay in a hotel in Bath? On average, 3-star hotels in Bath cost $112 per night, and 4-star hotels in Bath are $175 per night. If you're looking for something really special, a 5-star hotel in Bath can be found for $269 per night, on average (based on Booking.com prices). What are the best hotels in Bath near Roman Baths - Bath? 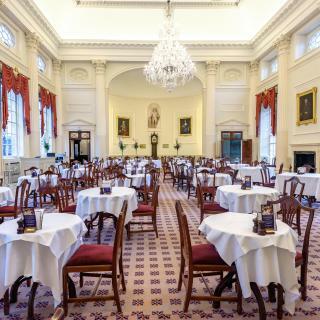 Some of the best hotels in Bath near Roman Baths - Bath include Hiding Space - St Catherine's Hospital, Student Castle - Bath and The Roseate Villa Bath. 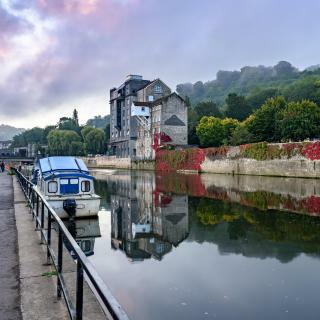 Which hotels in Bath have nice views? Combe Grove Hotel, The Roseate Villa Bath, and The Bird, Bath got great room view-related reviews from travelers in Bath. How much is a hotel in Bath for this weekend? The average price per night for a 3-star hotel in Bath this weekend is $344 or, for a 4-star hotel, $540. Looking for something even fancier? 5-star hotels in Bath for this weekend cost around $913 per night, on average (based on Booking.com prices). How much is a hotel in Bath for tonight? On average, it costs $109 per night to book a 3-star hotel in Bath for tonight. You'll pay around $142 if you choose to stay in a 4-star hotel tonight, while a 5-star hotel in Bath will cost around $217, on average (based on Booking.com prices). 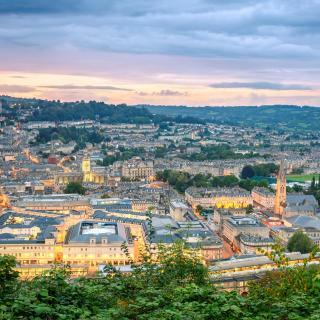 Which neighborhood is the best one to stay at in Bath? Milsom Quarter, Bath City Centre, and Artisan Quarter are popular with other travelers visiting Bath. Which hotels are the best ones to stay at in Bath? Henrietta House, The Gainsborough Bath Spa - YTL Classic Hotel, and Z Hotel Bath are some of the popular hotels in Bath. Wonderful, World Heritage site Bath is an impressive mix of Georgian architecture and Roman legacy. Its most famous landmark is the fantastic, natural hot spring Roman Baths. Although everything above the pillar bases is from a later period, you still get an idea of its appearance in Roman times. Sadly you can’t bathe here, but across the street the rooftop pool at Thermae Bath Spa offers views of Bath Abbey and the surrounding hills. Check out the stained-glass windows in the abbey, England’s last remaining Gothic church. Its square houses Pump Rooms dispensing hot spring water from the Roman baths. 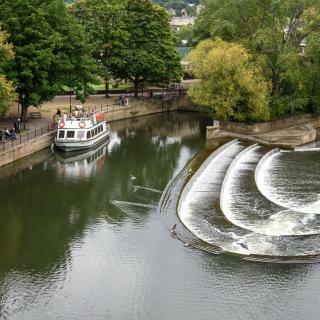 Just behind, the Parade Gardens by the Avon River overlook Bath Rugby Club, the multi-level Pulteney Weir and registered historic Pulteney Bridge, lined with shops. Other Bath shopping options include Southgate Shopping Centre, the bohemian Walcot Street market, and brand-name stores on Milsom and George streets. North is The Circus, a circular square lined with Georgian townhouses, only marginally less impressive than the Royal Crescent down the road. You can now visit number 1 Royal Crescent, restored to its 18th-century glory. 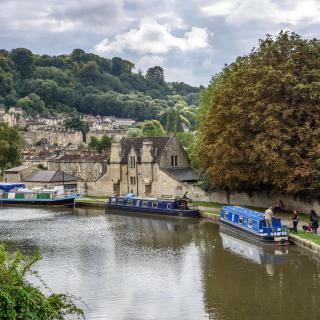 Before heading to Bristol Airport from your Bath hotel, take time to try the famous Sally Lunn Bun and stop at the pleasant pubs along the Kennet and Avon Canal. Stay near the city centre where everything is within walking distance. Take more than two days stay to see it all at a leisurely pace. Very family friendly and a million places to eat out at each day and night. Its a beautiful compact City. Its a beautiful compact City. Everything is within easy walking distance. If you are a history buff or in to architecture or just wants a pleasant day out it has what you will enjoy. Even the new shopping area blends in perfectly in to the old town. Bath is beautiful. The Abbey & the Roman baths are definitely worth a visit. Nice to take a walk along the river path. Bath is a great base to go exploring other areas, e.g. we were able to visit Stonehenge, Salisbury, Gloucester, Castle Combe etc, by using it as a base. Much nicer when weather is good too! The only negatives are that Bath isn’t a massive place, once you’ve done a day or two, you’ve pretty much seen it all. We also found hardly any places to eat & when we did find somewhere, we weren’t that impressed (but that was the same with all the places we visited). However Bath is well worth visiting. I loved everything about Bath. I loved everything about Bath. Such an amazing city. Lucky enough to spend a glorious week here. Stayed at SACO bath apartments which was a fantastic location. Staff were amazing too, nothing was ever too much trouble and they were always friendly. It is on a noisy street and we could hear the buses at night but we were happy to overlook that for the great convenient location and the wonderfully room apartment with all the facilities. I would book this accommodation again. It felt more like a town than a city it was so friendly and the buildings were amazing lots to do there and see even the weather was fairly good for the time of year. Thought the shops were great food did seem a bit expensive but good. The hotel was in a peaceful location yet only 5 minutes from Bath city centre. The rooms all had a small fridge which is an excellent idea in this hot weather to keep drinks and food cold. Rooms were of good size with a comfortable bed and was extremely clean. The spa was excellent and the staff couldn't do enough to help. I would say that all staff were polite and helpful at all times. Breakfast was lovely. I would highly recommend this hotel. Good location, just a short walk into the centre of bath. Parking permit for the road was provided as we couldn’t quite fit in the car park, which was really handy. The breakfast included was really delicious and great value. The staff were all extremely friendly and helpful. Our room was also lovely, right at the top of the hotel with big velux windows. The staff on the front desk were delightful and very helpful with directions into the main city centre. The room was beautiful, cosy and inviting. I loved the decor and consistent theme throughout the hotel. If in Bath again I will most certainly be staying here. The bathroom and bedding was extremely clean-not a speck of dust. Overall, wonderful!!!! As a solo traveler I loved this hotel. I particularly appreciated how friendly the staff was! They were all quick to help me with any inquiries I had. Bath is such a lovely place to visit. My stay was short, but it was made even better by the hotel staff, the location, friendly people in town and amazing food. I'd stay here again. Good inexpensive base for a tourist visit to Bath. It’s very basic accommodation & isn’t a hotel but the bed was comfy, there were en-suite facilities and the breakfast included was excellent. Bus travel into the city centre was frequent, easy & good value. There was also free secure parking for our motorcycle. Amazing location in the centre of town and with parking available through the hotel it made our quick trip to bath very easy! The rooms are comfy and clean. Most of all the staff made the difference as they were so helpful and welcoming. We would defiantly stay here again! Location is doors away from Sally Lunns tea & buns & very close to the Abbey & Roman Baths. Tour busses (for Cotswolds & Stonehenge) pick up right out the hotel’s front door. Nice bar & restaurant on site. Very friendly & helpful staff. Staff were so helpful - their recommendations were faultless! Complimentary use of spa village was very welcome. Added touches for my birthday from hotel management were very kind Location is the best in Bath! Toiletries were high standard. Fantastic staff member - Warrick suggested a pleasant casual place for dinner within walking distance of the hotel. He helped us with driving directions and suggested where to park in Bath. The room was quiet, clean, and very comfortable. The hotel is really close to Bath but without the ridiculous price of the city centre hotels. Landlady was lovely, Very friendly and very hospitable. Would definitely stay again if visiting Bath. The hotel was beautiful in pristine. Our room was spacious and comfortable with a lovely bathroom. We have been in Britain for two weeks and it is the best hotel about our trip. The staff (especially Anya), location and comfort was a trademark for the hotel. If I ever come back to Bath, this hotel is definitely a must stay. Fantastic hotel in Bath city centre, great rooms and spa facilities. Very friendly staff. Would definitely like to stay again. Really pretty, super-comfortable room, gorgeous garden tp walk in, prompt and delicious room service, really helpful staff. Loved it. All was tip-top - an overall great experience.